We're concentrating on the NFL this Monday night as we can't get any consensus between contributors on the Sheffield United vs Portsmouth game from League One! 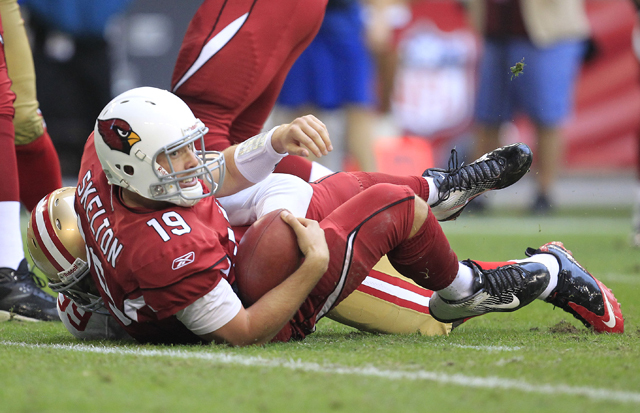 The San Francisco 49ers are visiting the Arizona Cardinals in the desert & it looks an intriguing game between the NFC West rivals. Arizona started the season out blazing a trail with 4 wins in a row including an impressive victory against the fancied New England Patriots at Foxborough but that good start has come grinding to a halt with three losses in a row to some of the league's lesser lights although all have been by a touchdown score or less. The 49ers have been trading at low prices for the Super Bowl after reaching the NFC championship game last season & have at times looked dominant but sometimes struggled when unable to establish their running game & have scored just 16 points over the last two weeks. San Francisco certainly have no problems on defense where they rank first overall in yards given up & have been especially difficult to pass against this year ranking first again & averaging just 272 yards against them in the air. The 49ers also remain tough to run against even though their giving up 20 more yards a game running than in 2011 when they led the league, their also the best team at running the football themselves with Frank Gore having a tremendous year up at 5.8 yards a carry for 601 yards total he's backed up well by Kendall Hunter. The only problem the 49ers have is when it comes to passing where they rank 29th (of 32) in the league with just 199.9 yards a game, Alex Smith has actually done ok with a decent passer rating & completion stats but he's been sacked way too much (18) for a quarterback who doesn't make many attempts per game (27.1). The Cardinals have also allowed their passers to get hit way too much with Kevin Kolb sacked a league high 27 times even though he didn't start in week one & is now out injured not playing last week either. John Skelton got sacked 7 times last week against the Vikings & it seems difficult to see how they are suddenly going to improve here against a physically dominant 49er front line who although only have 11 sacks in the year so far do manage to get great pressure on the passer & Aldon Smith in particular could have a field day. The Cards are without their leading rusher Ryan Williams & it will be most likely left up to La-Rod Stephens-Howling to step up & make the carries but this will be the toughest defense he's faced this year & he's only been getting 3 yards a carry anyway. Skelton is a mediocre quarterback anyway & with pressure in his face he's unlikely to find star receivers Andre Roberts & Larry Fitzgerald who represent Arizona's bets chance of success, it looks outright impossible for them to get the scores they need to compete here. On the plus side the Cards do have a good defense, ranking 7th overall, & the most points they've conceded in a game is just 21 (twice) so they shouldn't necessarily take a beating. Only one Arizona game has gone over 38 points & just two San Francisco games so take the under 38.5 total points on offer at 10/11 & enjoy the defensive battle.